Special FREE Webinar, Thursday, May 23 at 2:00 PM ET – SIGN UP TODAY! 6 Tips for Making Money Trading Options + 2 Hot Trades Now | Join Jacob Mintz, Chief Analyst of Cabot Options Trader, as he tells you how you can easily use options in your investing strategy to make more money. PLUS he'll start you off with two hot trades you can make right away! Great Growth & Value Stocks That Are Poised for Immediate Upside | on April 18, 2019 Crista Huff, Chief Analyst of Cabot Undervalued Stocks Advisor, spoke about learning how you can combine the best of three famous stock-investing strategies to enhance your portfolio returns and lower your portfolio risk. It’s been a bumpy ride these last few months, but analysts are expecting big things from small-cap stocks in 2019. The downdrafts that ended 2018 have created some small-cap bargains, making it a great time to buy. On February 13, small-cap expert Tyler Laundon will discuss the rewards of having small caps in your portfolio. He’ll talk about what went right, and not-so-right, in 2018 and give you a preview of what to expect in 2019. And he’ll conclude with secret stock picks from his new report (which you’ll receive FREE) that you won’t want to miss. In March's Lunch with the Analyst, Chief Analyst Mike Cintolo discusses his thoughts on the current market environment—mistakes to avoid, his (optimistic) market timing stance and outlook, and a couple of dozen new and potential leading growth stocks that have either lifted off or are set up to rise in the weeks ahead. He also answers questions on many individual stocks and describes techniques to make the most of this uptrend. 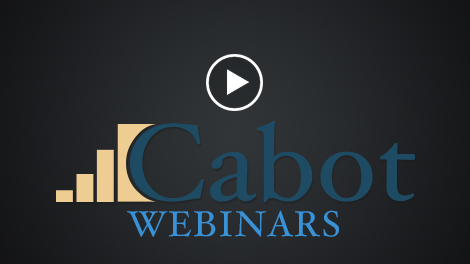 In this Lunch with the Analyst webinar, Cabot Emerging Markets Investor Chief Analyst Paul Goodwin offers an overview of market conditions and a range of stock picks. But the focus of this webinar is on what happens when markets finally stop their corrections and start to build a bottom.